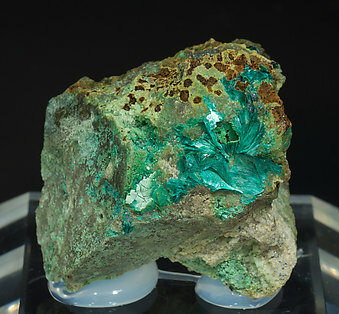 Deep green aggregates of thin laminar crystals on dark brown matrix. Aggregates of thin laminar crystals of Tyrolite. They are bright and the color is very deep. 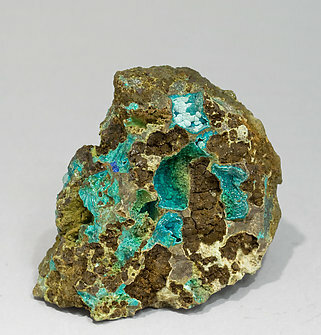 On matrix with Chrysocolla and Tetrahedrite-Tennantite. 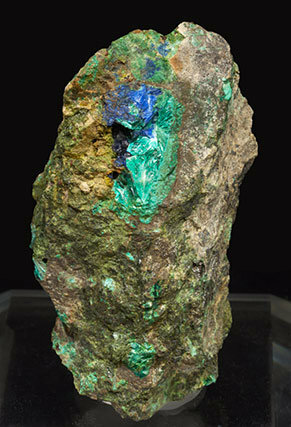 On the back of the label it is cited that it was collected by D. Joaquín Folch on the dumps of the mine in 1960. 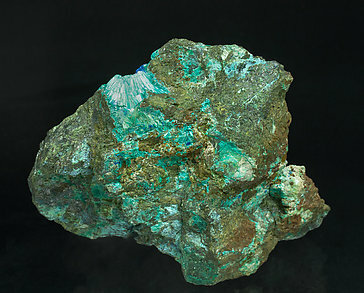 Radial leafy growths of bright green laminar crystals of Tyrolite that contrast with the darker rocky matrix. Very well defined radial Tyrolite aggregates of leafy crystals. The have an excellent silky luster and a pale bluish-green color. They are on matrix, with Azurite. Very well defined radial Tyrolite aggregates of leafy crystals. The have an excellent silky luster and a pale bluish-green color. 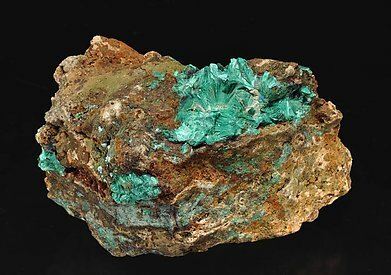 Leafy aggregates, some of them radial, of very well defined tabular Tyrolite crystals with an excellent silky luster and deep green color. 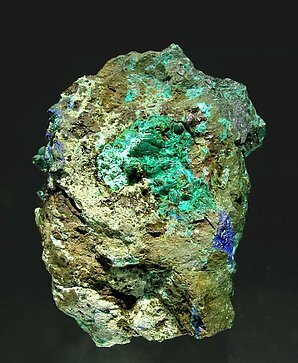 They are on matrix with Azurite and Chrysocolla. Very well defined radial Tyrolite aggregates of leafy crystals. The have an excellent silky luster and a pale bluish-green color. 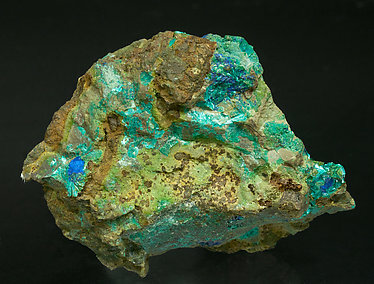 They are on matrix, with Azurite and Chrysocolla. 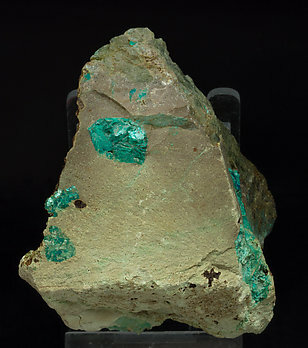 Aggregates of laminar Tyrolite crystals with excellent silky luster and pale green color. They are on matrix, with Azurite. Very well defined radial Tyrolite aggregates of leafy crystals. The have an excellent silky luster and a pale bluish-green color. 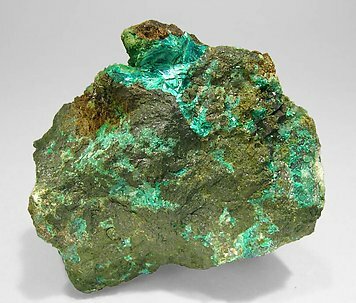 They are on matrix, with Chrysocolla. 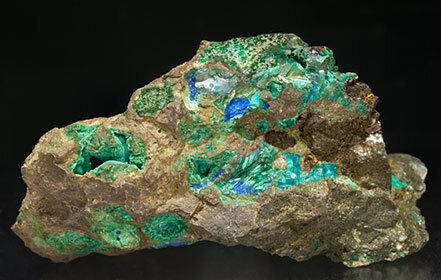 Leafy groups of laminar crystals on matrix, with Chrysocolla and vugs of small crystals of Azurite. Very well defined radial Tyrolite aggregates of leafy crystals. The have an excellent silky luster and a pale bluish-green color. 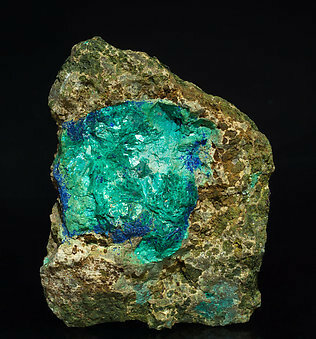 They are on matrix, with Azurite and Conichalcite. 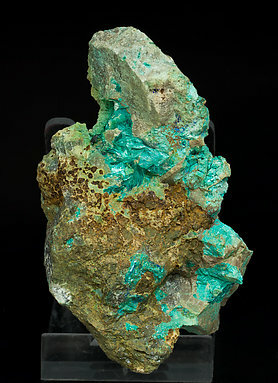 Fanlike growths of laminar crystals of Tyrolite with a green, slightly blue, color and rough growths of the same mineral, with Azurite and globular growths of Conichalcite on a limonite matrix. 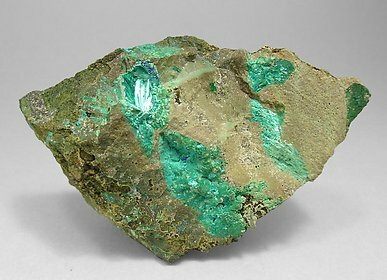 The Chrysocolla cited on the original label from Folch surely refers to the rough Tyrolite.